The latest instalment celebrating the unofficial great articles of Illogicopedia. 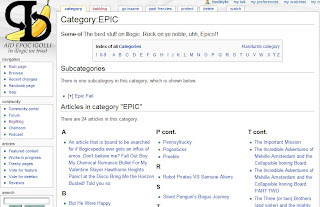 One of the most successful projects on ?pedia, 'EPIC' covers the long-winded story-like articles on illogicopedia. Originally conceived during a grand IRC meeting this category has blossomed, with EPIC after EPIC spiralling from are ready users' fingers. Recently the EPIC body count has risen with 4, would you believe it, 4 EPICs entered into the Illogic pickle. Veteran users have voiced their opinion that perhaps EPIC should be a separate judging category in this hallowed competition.